This sculpture certainly leads to interesting questions. Does it honor Native Americans or reinforce stereotypes? Does it leave you with a positive feeling? 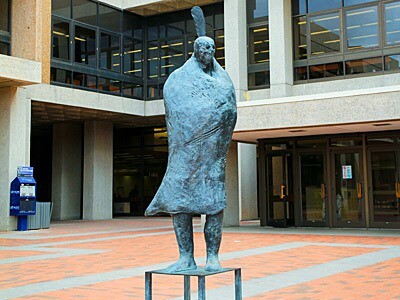 Can this sculpture fit into an art historical tradition of the Native American as a Noble Savage? This exceptional artwork was loaned to the UA Library by distinguished alumni Fritz Scholder and then given to the UA. His paintings mix Pop Art with Abstract Expressionism and often use a skull-like face, as seen in this sculpture. The eyes and the expression are vacant, blank, and non-specific. Scholder was invited to participate in the Rockefeller Indian Art Project at the University of Arizona in 1961. He graduated with an MFA Degree from UA in 1964. Fritz Scholder went on to become one of the country’s most celebrated artists, and was the 2002 Arizona Governor’s Arts Award recipient. He died in 2005.